El proceso de obtención del coque (o cok) en una batería de hornos moderna, siendo complejo, puede esquematizarse de modo que pueda hacerse comprensible para quienes carecen de conocimientos especializados. Tanto el esquema que reproducimos más abajo en español, cuya autoría desconocemos, como el relato en inglés, breve y ordenado, acompañado de una sección esquemática transversal de una batería y sus instalaciones complementarias, tomados ambos de un texto más extenso sobre seguridad e higiene del HSE Health and Safety Executive británico creemos que pueden ser de utilidad para nuestros lectores. De este modo, esperamos contribuir a una mejor comprensión de la conformación y funcionamiento de la última batería de coque del País Vasco, la de la factoría histórica de la Sociedad Anónima Echevarria en Santa Águeda, Barakaldo, actual PROFUSA, así como de su valor patrimonial al ser uno de los 100 elementos fundamentales del Patrimonio Industrial Vasco. Del carbón al coque (o cok). Esquema del proceso. 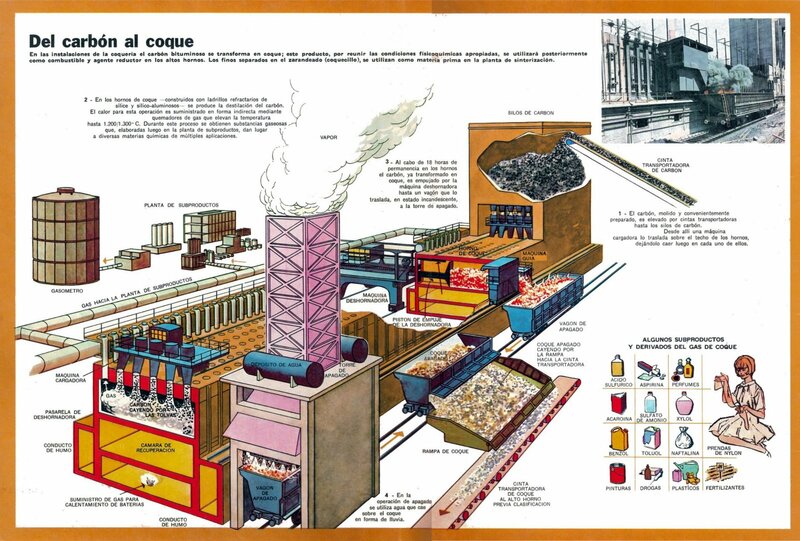 1 The coke oven is designed for the destructive distillation of ‘coking’ coals in order to produce metallurgical coke, usable ‘by-products’, eg ammonia, coal tar, benzol, naphthalene and ammonium sulphate and coal gas. Coke is produced in the UK primarily for use in blast furnaces at integrated iron and steel works. There are currently 11 coke ovens in the UK of which 7 are located on integrated steelworks sites. 2 Coke is produced in a form of regenerative ‘slot’ oven. Ovens are typically grouped in ‘batteries’ to enable efficient gas collection, fuel distribution, coal charging etc. There are several proprietary variants in use, but all fall into this broad description. A typical oven layout is shown in the diagram at the appendix. The fuel required to induce carbonisation is obtained from the recirculation of the coal gas produced in the process or at steel works by use of enriched blast furnace gas. 3 Heat transfer to the coal is achieved through conduction from the walls of the oven; heat is then transmitted through the bulk of the coal mass. The coking coals used undergo a thermal breakdown in these conditions, structurally changing to produce coke and losing, typically, some 20% of their weight as gaseous product. This gas is predominantly hydrogen and methane. Other components include carbon monoxide, nitrogen and water vapour. In addition, a variety of by-products are produced (the largest proportion of which are known as coal tar pitch volatiles (CTPVs)) which include a mixture of hydrocarbons of various molecular weights and structures. The most relevant constituents from the occupational health viewpoint are in the hydrocarbon mixture, especially the polycyclic aromatic hydrocarbons (PAHs), some of which are carcinogenic. 4 The coke battery comprises a large number of ovens, typically 50 to 80 per battery grouped in ‘sections’ of 15 to 20. The ovens are arranged side by side and charged and discharged on a cyclical basis, in a continual process, with gaseous products being taken off in a controlled manner to a gas handling plant. 5 Despite the controls however, significant dust and fume may leak from the battery fabric and gas emitted during charging and discharging the ovens. During these operations employees may be exposed to dust and fumes and also to the risk of skin absorption of PAHs from contact with spillages of coal or coke. 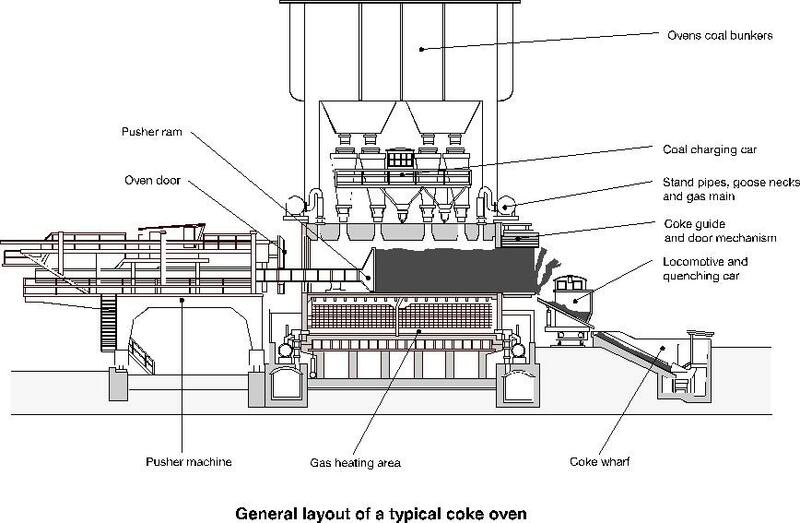 General layout of a typical coke oven. 6 The base of the battery is normally a cellar containing the gas supply and burner arrangements. Where enriched blast furnace gas (enriched with natural gas or coke oven gas or both) is used there may be a carbon monoxide hazard. There is a regenerator heating system for storing and re-using heat to preheat combustion air. The ovens are heated from underneath and the sides via flues between the oven walls. 7 Above the cellar is a platform and the base of the ovens. The ovens are typically narrow in section but deep and vary in length. They may be referred to as a 4 metre or 6 metre oven to indicate the width of the battery and the capacity. Ovens are arrayed side by side rather like the cells of a conventional car battery (hence the name). 8 The ovens do not take up the full width of the platform. Along either side of the battery the platform extends several metres to form a bench which allows access to the sides of the ovens for ‘pushing’ the carbonised charge out from the ‘ramside’ and for receiving the discharging coke on the other side, the ‘cokeside’ (see diagram at the appendix). Up to 3 electrically-operated rail-mounted ‘cars’ operate on both sides with specialised equipment to perform their functions; a ‘ram’ or ‘pusher car’ for discharging the coke and a ‘guide’ car on the other (coke) side. The cars provide access to the oven doors and seals for operators both for normal operation and for dealing with leaks. 9 The ‘pusher car’ has an electric ram to push the coke out from the side after the door has been removed by other equipment mounted on the car. After cleaning the surfaces the door is replaced and the seal made. 10 The ‘guide car’ removes the oven door on the coke side, and receives and channels the coke into an electrically operated rail mounted ‘coke car’ run at ground level alongside and below the bench. The guide car then replaces the door and seals. 11 The charge in the coke car is then taken under the quenching tower to cool it before being tipped onto the ‘coke wharf’. This is located below and outside the coke car track and serves as a final cooling area prior to release and conveying to the blast furnace bunkers or hoppers for temporary storage. 12 The next level is the battery top where the charge car operates. This is electrically operated and rail mounted. Blended coal is discharged into several hoppers on the charge cars from the conveyor-fed coal bunkers above the battery top. The charge car then moves down the line of ovens removing the lids (between 4 and 6 per oven typically) on one oven at a time mechanically either by magnets or hooks. On some ovens the lids are removed manually. Coal is charged into the oven charge holes through sleeves suspended from the car hoppers, usually in a planned sequence to minimise interference with the extraction arrangements. 13 The sleeves are adjustable and provide a good seal around the oven charge holes. After charging the lids are then cleaned, replaced and resealed. Silicate compounds are traditionally used for resealing but other compounds, eg gypsum are sometimes used. The ram on the pusher car levels off the charge of coal inside the oven from a special opening in the top of the oven door.